The only thing brighter than Pat Light’s performance on Friday had to be his pitching coach’s smile. How could Jim Belanger not have an ear-to-ear smile when thinking about what Light did in the series opener at LIU Brooklyn? 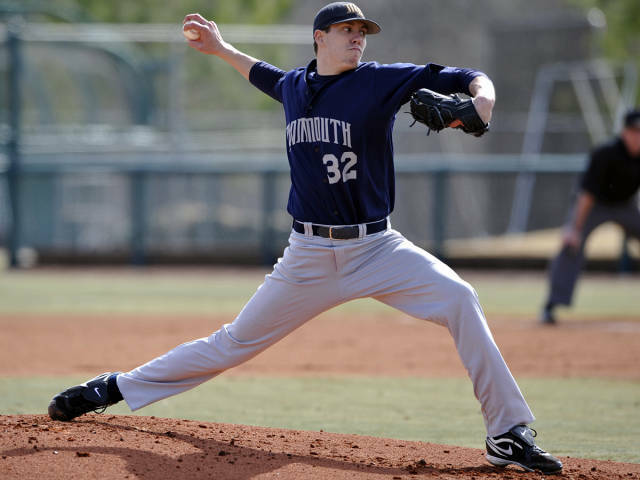 Although the Hawks’ bullpen may have given Belanger a scare when it relieved Light in the ninth, Monmouth held on for the win and his staff’s No. 1 starter was nothing but DOMINANT. Light, one of the top pro prospects to ever come through the Northeast Conference, continued to show why MLB scouts come out to his starts in droves. Over his first 8.0 innings of work, Light allowed no runs and four hits and retired the side in order during four of those frames. “Pat had all three pitches working this weekend and he is real tough when that is the case. When he has his best stuff he gets into a great rhythm which is was what happened on Friday,” said longtime skipper Dean Ehehalt who recently picked up Win No. 500 in a Monmouth uniform. Light wound up exiting in the ninth after surrendering a lead-off double, but not before he tied Monmouth’s single-game program record for strikeouts (15). Not since, former Monmouth Hawks Glen Keeton achieved the feat in 2004 did a NEC pitcher fan 15 batters. Not impressed yet? The next line will change that. While striking out 15 batters, Light did not issue a single base on balls. That’s right, 15 Ks, NO WALKS. As amazing as the feat is, it should not be a surprise that Light of all people pulled it off. After all, before the season started, teh highly-esteemed Baseball America tabbed Light the No. 25-ranked pro prospect on its Early 2012 Top College Prospects piece. Still, great control is something young, hard throwers don’t always have. Light has it though, and has been showing it all season long. “He really battles and competes every Friday,” said Ehehalt. And it shows. In six NEC starts, Light owns a 5-1 record and 1.47 ERA. He has struck out at least 10 in four of those contests. Overall, Light sports a 2.69 ERA over 80.1 innings of work. His strikeout-to-walk ratio is a whopping 7.36-to-1. HE has K-ed 81 batters while issuing only 11 bases on balls. Well, that’s OK then because the Collegiate Baseball News was highly impressed. The publication tabbed Light one of its five Louisville Slugger National Players of the Week. The announcement came shortly after the NEC tabbed Light the league’s Pitcher of the Week for the third time this season. When it looked like LIU Brooklyn was down and out, the Blackbirds spread their wings and flew to the top of the team leader board on the final day of the 2012 NEC Women’s Golf Championship at LPGA International in Daytona. One day after only rookie Cristina Felip shot a sub-80 second round, all four Blackbirds were in the 70s. The turnaround allowed LIU to erase a 9-stroke deficit heading into the final round and fly home to Brooklyn with its first team title since 2005. The roster says Felip has freshman status, but the Spaniard looked like anything but a rookie throughout the entire course of the weekend. She carded a three-round score of 215 (73-70-72) to finish 1-under par and claim the individual NEC crown. Although LIU has only two team titles in its history, a Blackbird has been the event’s medalist each of the past three years. FDU, which had won the previous four NEC team titles, was led by Annika Karlsson and Esther Park, who both shot 10-over for the three-day tournament. They weren’t one of the 253 whose names were announced at the podium in Radio City Music Hall, but they still received a phone call every Pop Warner player in America hopes to get someday. Monmouth’s Jose Gumbs and Duquesne’s Connor Dixon both earned a chance to play at the next level. The former hard-hitting defensive back and the tall, athletic receiver signed deals with National Football League clubs only minutes after the 2012 NFL Draft concluded on Saturday night in New York City. “It means a lot to this program. But not only does it mean a lot to Monmouth, it means a lot to the Northeast Conference. It says that it’s a good conference athletically, and that guys do have the ability to play at the next level,” Gumbs told the Asbury Park Press earlier in the week, referring to the numerous looks he and other NEC players were receiving from NFL clubs. While Gumbs heads south, Dixon is making the short trip from Pittsburgh’s Rooney Field to Heinz Field where he’ll get a shot at donning the Black & Yellow for his hometown Steelers. Only minutes after Gumbs and Dixon signed their deals, it was announced that Wagner’s former all-NEC linebacker Julian Stanford would be joining them in an attempt to break into the NFL. Stanford, a tremendous athlete who spent much of his career harassing opposing signal callers, signed an Undrafted Free Agent contract with the Jacksonville Jaguars. Standing at 6-foot-2 and 215 pounds with good speed, Stanford can be a hidden gem for a team in search of a pass rusher with explosiveness off the edge. The all-NEC first team selection logged 11.5 tackles for loss, including 5.0 quarterback sacks, and also made three interceptions as a senior. Stanford also proved valuable on special teams at Wagner and could very well carve out a niche for himself in that area at the next level. 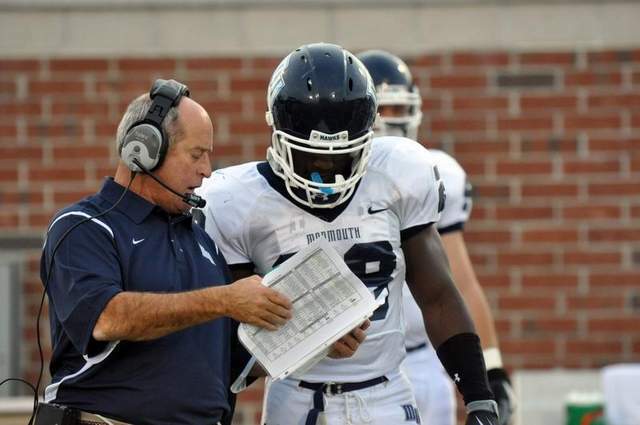 Meanwhile, Gumbs spent each of the past four seasons as Monmouth’s leading tackler. One of the hardest hitters to come through West Long Branch, the strong safety earned three consecutive selections on the All-NEC First Team. Gumbs impressed fellow Hawk Miles Austin in an offseason workout three summers ago, prompting the Pro Bowl receiver to laud him in the local press. Dixon traveled an unconventional path prior to arriving at his current destination. A backup quarterback at Michigan State as a freshman, the 6-foot-5 Pennsylvania native transferred home to the Keystone State in 2009. Starting under center in his first game at Duquesne, Dixon torched Bucknell for more than 400 yards and six touchdown passes. It wasn’t long, however, until chronic shoulder problems forced the Harrisburg, PA product out to the flank where wound up thriving. In 2011, Dixon made 40 receptions for a staggering 792 yards (19.8 ypc) and a program-record 16 touchdowns. The NEC may not have a long and illustrious history when it comes to the NFL Draft, but the talent within the Division I FCS conference has grown over the years and scouts and general managers alike are taking notice. There are no Andrew Luck or Justin Blackmon-caliber prospects coming out of the Northeast Conference this season. In fact, it’s highly unlikely that a NEC player will hear his name called during the First Round of the 2012 NFL Draft, which will unfold on Thursday night. When the later rounds roll around, however, the NEC has the type of hidden gems that GMs drool over. A little-known receiver from Monmouth at the time, Austin signed an Undrafted Free Agent contract with the Dallas Cowboys and the rest is history. After working his way up the Dallas depth chart from return specialist to starting wide receiver, Austin has had two 1,000-yard seasons and has grabbed 28 touchdown passes. In 2009 though, the Miami Dolphins didn’t pass on Monmouth tight end John Nalbone. The four-time all-NEC selection, who projected as an H-back at the pro level, has yet to join Austin in the Pro Bowl, but is still hanging around the lead and will have a chance to break through with the Seattle Seahawks this summer. Through players like Austin and Nalbone, Monmouth, which founded its football program in 1994, is becoming known for its potential to produce NFL talent and all-NEC safety Jose Gumbs is looking to further that reputation. As he explained in a story by Asbury Park Press columnist Steve Edelson, Monmouth head coach Kevin Callahan knew he had something special when Gumbs arrived on campus in 2007. “He was different,” said Callahan. “You knew right then his skillset was different than the others out there.” Read Edelson’s whole column here. Physical measurable, speed, and upside all factor into a player’s draftability, but if teams are drafting based upon accomplishments at the collegiate level, then Gumbs is their guy. The Queens, NY native was Monmouth leading tackler in each of the last four seasons. He won t he NEC Defensive Rookie of the Year award in 2008 and added the Defensive Player of the Year honor to his resume 12 months later. Gumbs, however, isn’t the lone NEC player drawing scouts’ attention and Monmouth is the only NEC member with a history of producing NFL talent. UAlbany, a program that has continually grown under the steadfast leadership of the legendary Bob Ford, saw defensive back Rashad Barksdale go to the Philadelphia Eagles during the 6th Round of the 2007 Draft and may see its quarterback don a NFL jersey by the end of this weekend. Dan Di Lella, a 6-foot-5 signal caller who has made a meteoric rise over the past eight months, is looking to become the first ever NEC quarterback to receive that coveted phone call from a NFL team on Draft weekend. Behind sophomore Buddy Leathley on the depth chart during summer camp, Di Lella stepped under center to relieve Leathley in Week 1 and remained on the field for what was a remarkable senior season. Di Lella, who has the size and arm strength NFL scouts look for, threw for an all-time program high 2,548 yards in leading the Great Danes to the 2011 Northeast Conference crown. The former Somerville (NJ) High School quarterback completed 25 touchdown passes compared to 10 interceptions this past fall. There are other NEC names, such as Duquesne’s Connor Dixon or Robert Morris’ Shadrae King, that may make their way onto NFL draft boards over the next few days. Now, it’s time to wait and see if any of these hidden gems are given the chance to sparkle. Continuing his annual pilgrimage out to the Mercer County Tennis Center, Ron Ratner seemed excited about the three days that lie ahead. The NEC’s grizzled veteran of a tennis administrator has been overseeing the NEC Tennis Championships since 1999 when the tournament took on a team flighted format and found a new home in Mercer County, NJ. Upon arriving at Mercer County Tennis Center set back within the grounds of plush Mercer County Park, the NEC Tennis Championships have never left and the reasons go beyond the fact the park is located in the epicenter of the NEC’s geographic footprint. With more than 20 outdoor courts, the venue allows the NEC to service its 19 men’s and women’s tennis teams, which feature nearly 150 student-athletes. Should inclement weather attempt to put a damper on things, as was the case in 2011, Ratner can move the tournament indoors and business can continue as usual. “We’re hoping to avoid what happened last year because of the weather, but it is good to have that safety net should we need it,” said Ratner. While he’s hoping for good weather, Ratner is expecting to see some great tennis. Fairleigh Dickinson was the runner-up in both the men’s and women’s preseason coaches’ polls, but owns the No. 1 seed on both sides heading into the tournament, the winner of which will receive automatic access into the NCAA Championship bracket. Ratner also points to the “steady rise” that has taken place with the Monmouth men’s program under the direction of Mickey Cook, and sees the Hawks as a possible threat to FDU. Then, there’s also defending champion Sacred Heart and perennial title contender Quinnipiac who are capable of making a run deep into the weekend. “The FDU women also proved worthy of the No. 1 seed with its regular season resume and has really benefitted from the emergence of Anna Rapoport as an elite player,” said Ratner. Overtime! isn’t quite sure who will win it all this weekend, but we do know one thing – Set for his 14th appearance as the tournament director, Ratner is revved up and ready to go. NortheastConference.TV personality Craig D’Amico, who doubles as a local tennis coach, will be on the scene all weekend long to deliver live updates to NEC Tennis fans. 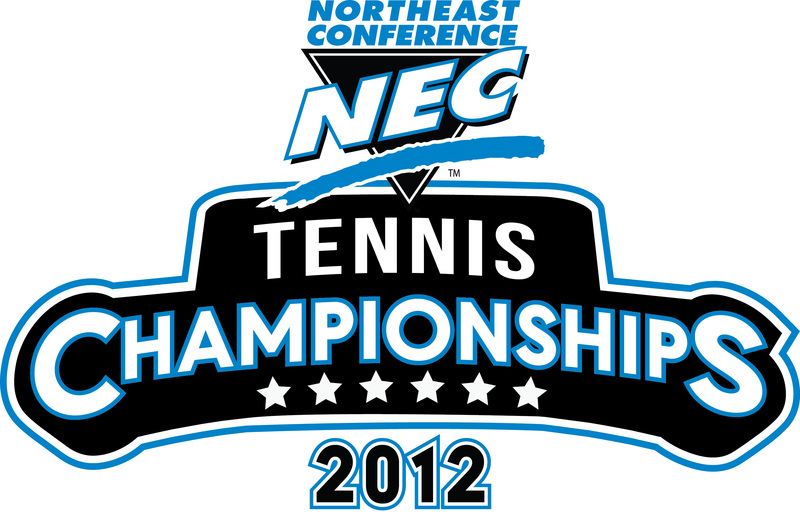 The NEC’s resident tennis guru, D’Amico will be blogging live as well as disseminating information via Twitter (@NECTennis). A quick glance at D’Amico’s personal Twitter feed shows that he, like Ratner, is more than ready for what lies ahead.